Until I discovered this recipe, my favourite roast chicken recipe was a rather unhealthy but delicious version picked out of Nigel Slater’s Real Food, which is also one of my all-time favourite cookbooks. 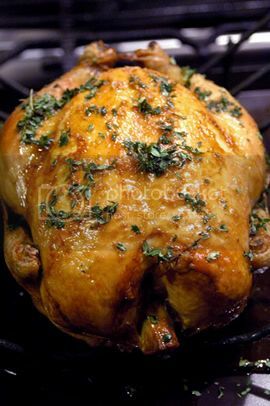 Nigel’s version asks us to rub our chicken inside and out with butter (herb butter, granted, but still butter). The recipe my wife and I now like best—which is the topic of this post—comes from Thomas Keller’s Bouchon cookbook. In fact, it’s the very first recipe in the book, and one that, when we first read, we didn’t quite believe. It calls for nothing more than salt and thyme (and of course the chicken). First, get a really good, big bird. Wash it and pat it dry. Preheat your oven to 230 Degrees Celsius (450F). Sprinkle some good salt over the bird-preferably inside and out. We like using fleur de sel but for the bird above we used some wonderful Murray River salt flakes, picked up on a trip to Adelaide. Truss the bird and then place it on a roasting pan (you can sprinkle a tad more salt over the bird if you want). Roast it for 50-60 minutes. Take it out of the oven, off the pan and let it stand for 15 minutes. While it’s resting, sprinkle the fresh thyme over the bird and pour some of the pan juices over the bird. The chicken comes out moist, tender, and delicious. The skin will be lovely and crispy. All you need to make it better is a glass of wine and a side salad. The bird pictured up top was made over the weekend for my wife’s sister—back for the weekend on holiday from Beijing—and a good friend who was leaving town for a few months. We started the meal with a roasted vegetable tart and finished it off with some macarons from Canele. With the chicken, we enjoyed a lovely bottle of Veuve Clicquot Brut. I just stumbled across this older post. But I have to tell you, this Thomas Keller recipe is totally fantastic, and I didn’t quite believe it at first. Ironically, I made it for a very close friend from visiting from NSW, and it was the best one we’ve ever had. A big THANK YOU. Stumbled on this recipe by googling “Roast Chook” – not only found this brilliantly simply and tasty recipe, but your great blog. Everyone I cook this chook for comments on how delish it is – it’s now one of our staple meals. My partner often requests it! Proves my belief that great cooking really can be simple (for those who, like me, hate to fuss).